Most units on ecology include some introduction to the world’s biomes, though I’ve found with my high school classes, most students already have a fairly good idea of what those biomes look like. When I mention the word “savanna,” my freshman students are quick to point out that it’s the setting for “The Lion King.” Similarly, “The Jungle Book” comes up when talking about rain forests. 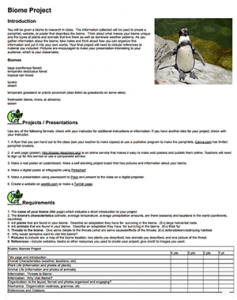 This project is intended to encourage students to become experts in one biome and share with the class. They can choose their project format from a list of possibilities such as a prezi, pamphlet, poster, infographic, or website. Students should work in pairs, or at most in groups of three. I’ve found that groups of four are not as effective since it leaves at least 1 or 2 members with not enough to do. Specific requirements provide students with details on what should be included in their final product, but they have the freedom to present it in a creative and personal way. A rubric is included for grading purposes. Students can either use the handouts provide here or send them to the project page to save paper. The google doc is editable, just save a copy to your own drive.